Birds can be one of the most enjoyable animals to observe in the wild. They can also be one of the most destructive and annoying of all of the nuisance animals. Bird droppings can cause health problems and their nesting material can be a fire hazard if it is allowed to accumulate in attic fans and vents. Birds can also be a serious threat to aviation and agriculture. 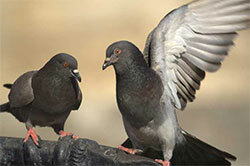 The most common nuisance birds in SE Michigan are pigeons, sparrows and starlings. They are not federally protected but the State of Michigan does require that a person holds a permit for their control. Only trained professionals with the proper equipment should attempt bird control or nest removal. Pigeons are decedents of the rock dove of Europe and Asia. They were introduced to the United States as a domestic bird but developed in to one of the most destructive pest birds. Pigeons may congregate in flocks of a hundred or more and leave behind large amounts of droppings and nesting materials. The best way to control pigeons is by trapping and removing as many birds as possible and installing bird spikes and other methods to prevent them from roosting and nesting. 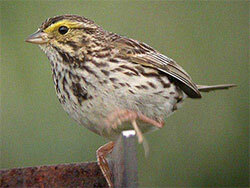 Sparrows were introduced to the United States in the 1850’s and flourished throughout the country. They seem to prefer human altered habitats in cities and around farms in rural areas. They make their nest in construction voids in roofs and sometimes end up in attics or lofts. They can sometimes be seen flying inside of department stores and warehouses. Exclusion and trapping are common ways of controlling sparrows. Starlings were introduced to the United States in the 1890’s when 60 birds where brought to New York. Today there are over 140 million starlings throughout North America. Starlings are robin sized birds that weigh about 3 ounces. They are black with light speckles. They like to nest in holes and cavities in trees, rocks, siding and roofs. Starlings are pest because of their large numbers. They leave behind large amounts of droppings and nesting material which may cause health and fire hazards. Exclusion is the best way to control starlings.